With a runoff election fast-approaching, one of Brazil's two presidential candidates is hoping to win some more votes with her very own videogame. Dilma Rousseff, one of Brazil's leading presidential candidates, knows what the kids like these days: videogames. The political hopeful has cashed in on this trend by appearing as a prominent character in a Super Mario Bros.-esque Flash game. Her opponent, JosÃ© Serra, also makes an appearance as a zombie. 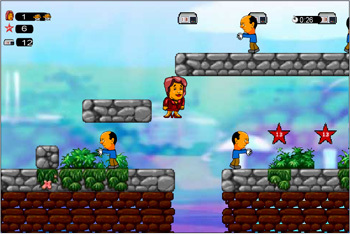 The game requires Rousseff to gather red stars, which are the symbol of Rousseff's political group, the Workers' Party. Meanwhile, players have to avoid the lurching undead abomination that is Serra, who is a member of the Social Democratic Party. Toucans, which are the symbol of Serra's party, also appear throughout the game and attack players. Rousseff and Serra are actually going to be in a runoff election on October 31st because none of the original three candidates grabbed more than 50% of the vote. Rousseff is current president Luiz InÃ¡cio Lula da Silva's named successor and, according to MSNBC, she has a ten point lead on her opponent.